Anyways, with back to school being here before we know it *insert profusely crying emoji here* I thought I'd share a fun DIY/project to make it a little less saddening. 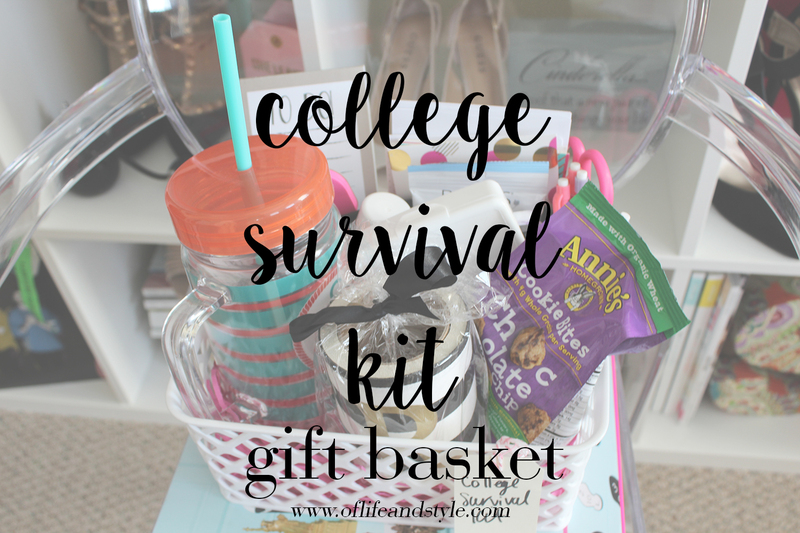 Now this is geared towards all you college kids heading back to campus, but can also work for high schooler's too! I'm actually giving this to one of my best friends from high school because she's leaving me for college at Vanderbilt in Tennessee. 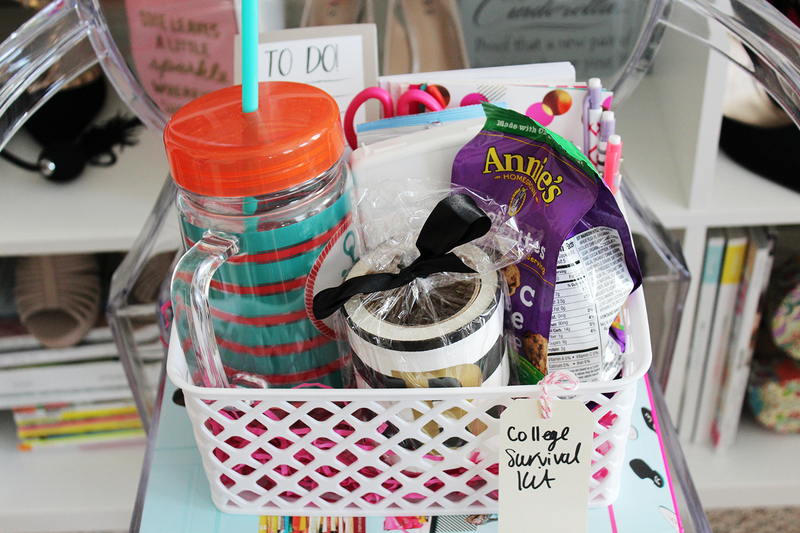 So I wanted to get her a fun, practical going away/back to school gift and this is what I came up with! So whether you're a mom, sister, girlfriend, brother or best friend this would be the perfect going back gift! And it can work for guys or girls! 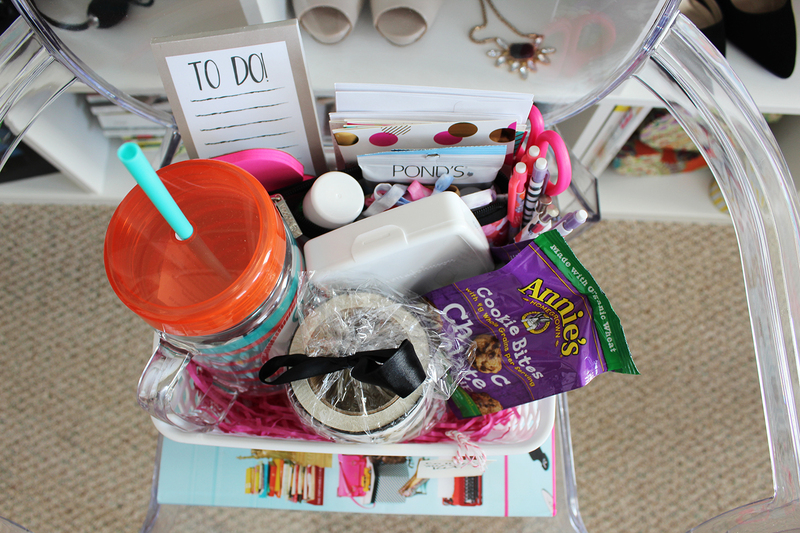 First off you're going to need a basket to hold all your goodies in. You can use a plastic one or one of the foldable storage ones. It's up to you. I bought this one from Wal-Mart. Other great places to look are Target, Marshall's/Home Goods, TJ Maxx, Ross and Kirkland's. Now you can either fill the bottom with this Easter basket filling or leave it empty. I filled mine to take up some space and make it look prettier, but again it's up to you. Lastly I finished it off with a gift tag from the $1 section at Target. Next is the fun part, filling the basket! 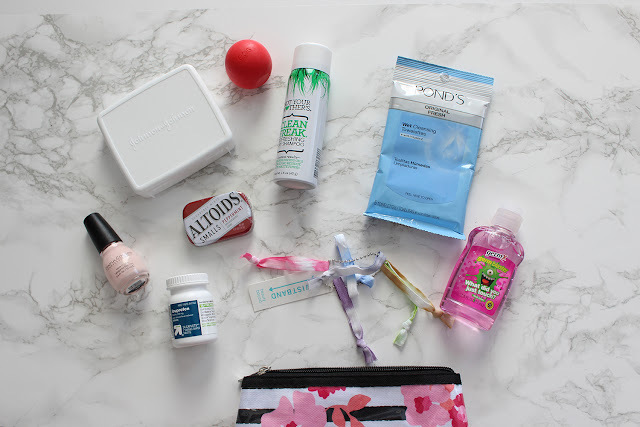 I broke my goodies up into three categories: energize, glamorize and prioritize. I tailored the items to fit the three categories and tried to find items that all kinda matched my theme: preppy, girly, striped/floral pink, white and bright colors. First up is the energize section. I included a monogrammed koozie from Kirkland's, Annie's chocolate chip cookie bites and an anchor double walled tumbler, also from Kirkland's. Their phrase is 'anchor down', so I thought the tumbler was quite fitting! I might include some popcorn bags and a few other snacks too. You can add whatever food and drink items the recipient likes! 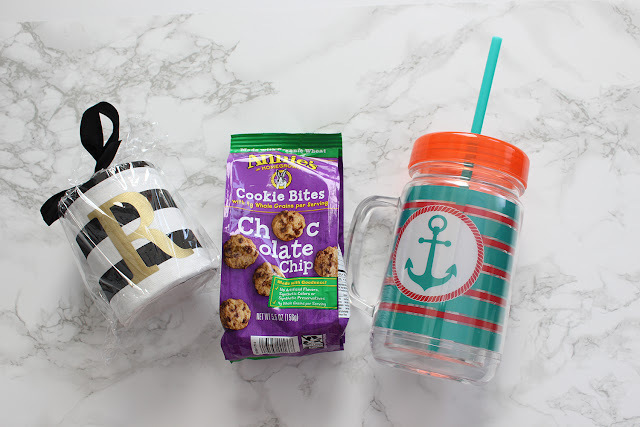 What I love about this gift is that it's totally customizable to the personality of the person you're giving it too. Maybe they like working out, you could include a water bottle or workout DVD's. Or they love art and drawing you could include colored pencils and a sketch book. The possibilities are endless! Next is the glamorize section. For this you can include anything related to makeup, health and beauty. I wanted to make sure there were the 'essentials' to aid for a late night out or an early morning of classes. I picked out an EOS lip balm, a mini first aid kit, a neutral pink nail polish, ibuprofen, mints, a mini dry shampoo, makeup remover wipes, hair ties and hand sanitizer. I found all the items at Target in their 'travel' section. I fit it all in this super cute striped and floral makeup bag from Walmart. Some other great items to include are mascara, eyeshadow palette, lotion, bodywash, mini shampoos and really any other beauty item! 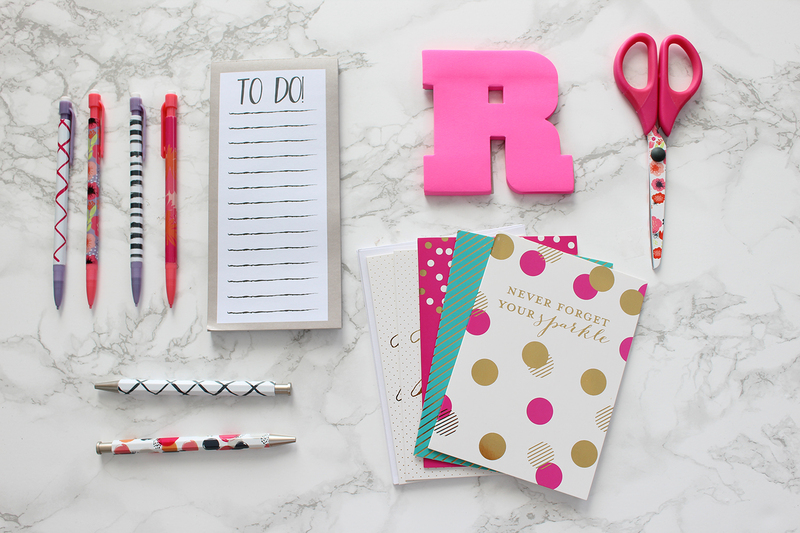 Other great items to have are washi tape, planner, notebooks, sticky notes, page tabs, etc. Pretty much anything related to school supplies can work for this section. My favorite place to find stuff is from the $1 at Target, as you can tell. They have such fun and bright colored items that are perfect for back to school! The finished gift basket all assembled together! I love the way that it turned out and that everything is a useful item for your back to schooler! Some other great section ideas are laundry: wrinkle releaser, closepins, etc., working out, decor, kitchenware: utensils, cups, etc., movie night: popcorn, DVDs, etc., and odds and ends: command strips, tape, etc. Like I said earlier this is a completely customizable gift. It can be tailored to fit any personality and you can add whatever items you want to it. This is also super budget friendly too. You can make it as big or small as your bank account will allow! I think this is such a great gift to give and whoever is receiving it will be so grateful to receive such a fun basket of stuff! I know I sure would! I hope you all enjoyed this little DIY project. Let me know if you did in the comments below or what you'd want to see in a basket if you had one! 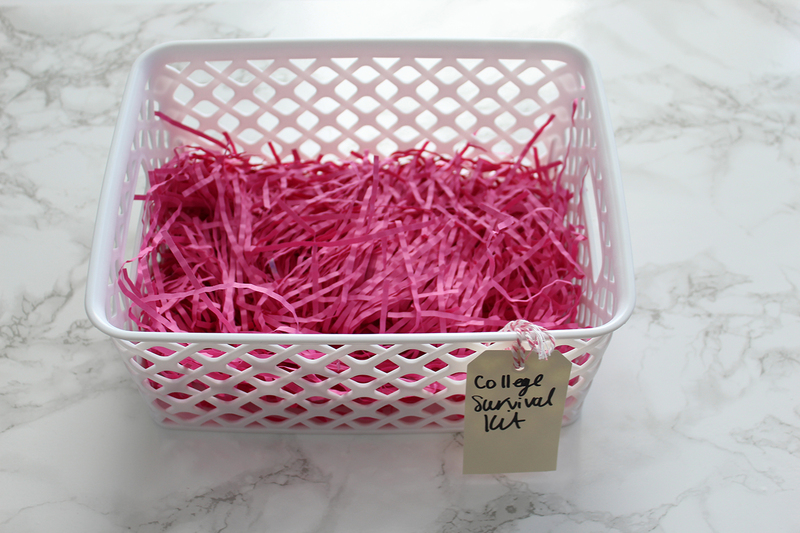 Really thoughtful and excellent gift basket idea!